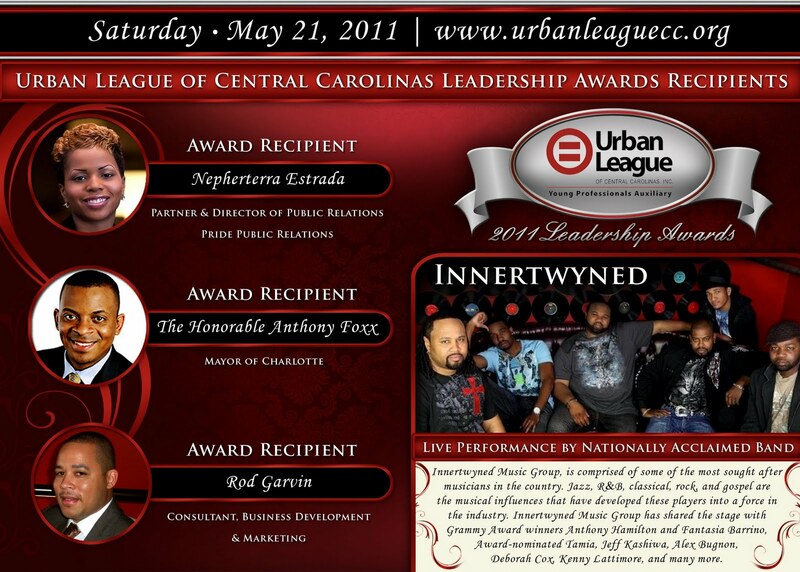 The Urban League of Central Carolinas will hold its 2011 Leadership Awards on Saturday, May 21, 8 p.m. at The Omni Hotel (132 E. Trade St.). The recipients, who are being honored by the ULCC's Young Professionals Auxiliary, are Nepherterra Estrada, partner and director of public relations at Pride Public Relations; Anthony Foxx, mayor of Charlotte; and Rod Garvin, consultant, business development, and marketing. The event will be hosted by Rahman Khan, of GoodWorks TV, and feature entertainment by R&B/jazz band Innertywned. I've witnessed firsthand the work of each of the three people being honored, and they've all contributed to Charlotte becoming a more vibrant, inclusive, and progressive city. Tickets can be purchased in advance for $35 or two for $60. The price will be $45 at the door. Click here for more details, including bios on the recipients, and to purchase tickets.